Always carry a net with you. It’s a lesson I should know by now given the number of good fish that I have lost over the years due to the absence of a net. The same was true here on an early November morning. I was leaving on the 11 O’clock ferry but figured I could get a little fishing in before the departure time so was out at the pier at the crack of dawn, at 5:40 in the morning. It was still dark upon arrival but by the time I was rigged up, the Sun was starting to show. I was ready with two outfits, my normal light action rod and reel that I hold, and a heavier rod utilizing a Shimano Baitrunner reel placed against my cart and set on free spool. Unfortunately I did not have the net with me. The net was back at the room with the companions who were still sleeping. Naturally I would soon have a good hit and wish I had that net. I had baited the lighter outfit with ghost shrimp on a high/low rigging and almost as soon as I made my first cast the fish hit the bait. I immediately knew it was a good fish and also quickly realized that I might need a net. It fought hard but I was careful to keep it away from the cables that I could see. One rush was toward a mid-water rope and some kelp but I was able to turn it away and head it toward the dock. After what seemed about five minutes the fish was near the dock and I soon was able to see that it was a beautiful ocean whitefish, the largest I had ever seen from a pier. I guesstimated the length at 30 inches when it reached the top and I bent down to hand line it up. This is always the moment of truth and once again the need for a net would prove true. I just about had it to the dock when it gave a jerk; the fish was gone and I was sick. Looking at the leader the problem was obvious, the hook gotten bent slightly and apparently that was enough to let the fish get off. It would have been the biggest fish of the trip. Shortly thereafter, Mike Granat, another early riser, joined me and soon after I hooked into another nice fish. This time it was a male sheephead around 18 inches in length. Luckily the hook was deeply embedded in the mouth and Mike was able to pull it up. 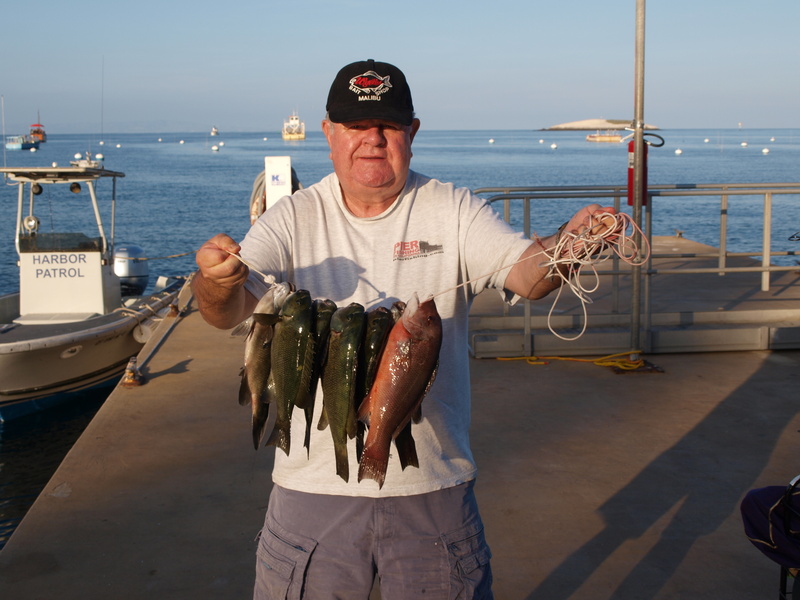 The two fish showed that the Catalina species are there and that some of them are big. Environment. The Isthmus Pier at Two Harbors looks like a miniature version of the Green Pleasure Pier (GPP) at Avalon sans the green paint and the various landing ramps that adorn the GPP for the Glass Bottom Boat, Yellow Submarine, etc. The pier and dock (where the ferry lands) is located in Isthmus Cove, a small cove on the leeward or northern side of the island and one that is heavily dotted with moorings and anchorages. Most of the cove’s bottom seems to be sand and there are less rocks and kelp than the piers at Avalon (and seemingly less fish). 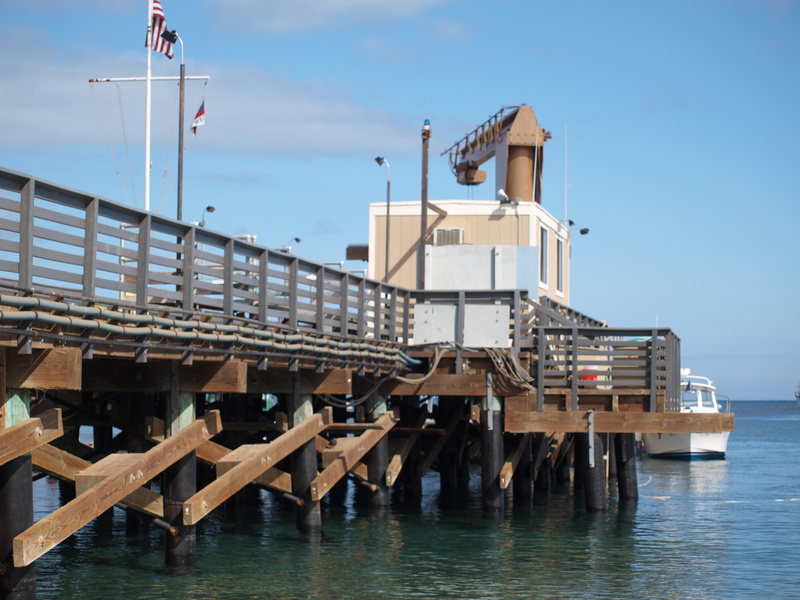 Fishing is primarily conducted from the pier itself, a couple of corner positions out at the end, and on the dock. 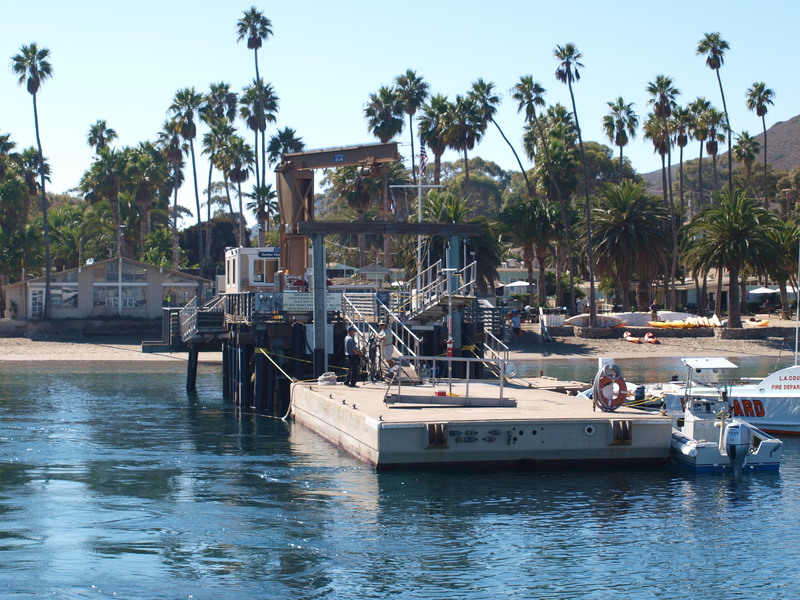 Generally it is OK to fish from the dock unless a ferry is landing but larger boats will also frequently pull up to get gas and/or supplies. The key is to stay out of the way of the workers and during the summer that can be more difficult. During much of the winter there is usually little problem in fishing from the dock. Of course you do have to watch out for the various ropes that connect the pier and dock as well as the numerous cables that are hooked up on the bottom to the dock. Although care should allow most fish to be landed, an especially large fish can be difficult to land given the ropes and cables. It’s a chance you have to take. As for the fish themselves, they are easily seen down in the crystal clear waters. 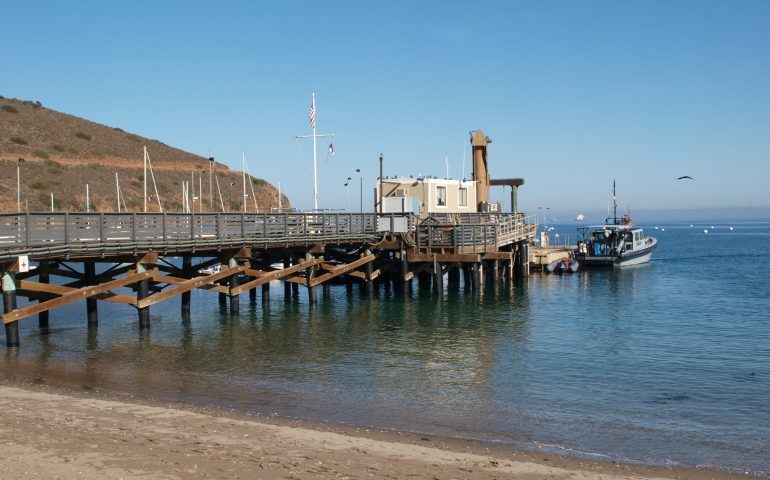 Perhaps it’s the lack of rocks and kelp, or maybe it is the fact people aren’t throwing fish feeding pellets into the water throughout the day, but whatever the cause there seem to be less fish at Two Harbors than at Avalon. However, the normal species are present—kelp bass (mostly small), opaleye, sheephead, ocean whitefish, halfmoon, senorita, rock wrasse, giant kelpfish, pelagics (sardines, jack mackerel, and Pacific mackerel), and sharays (horn sharks and bat rays) although the latter are only common at night. Fishing Tips. The problem here, like Avalon, is to keep the small fish from stealing the bait intended for the larger fish. As soon as you drop bait into the water it is generally attacked by a hoard of the smaller fish (especially bait stealin’ senorita). 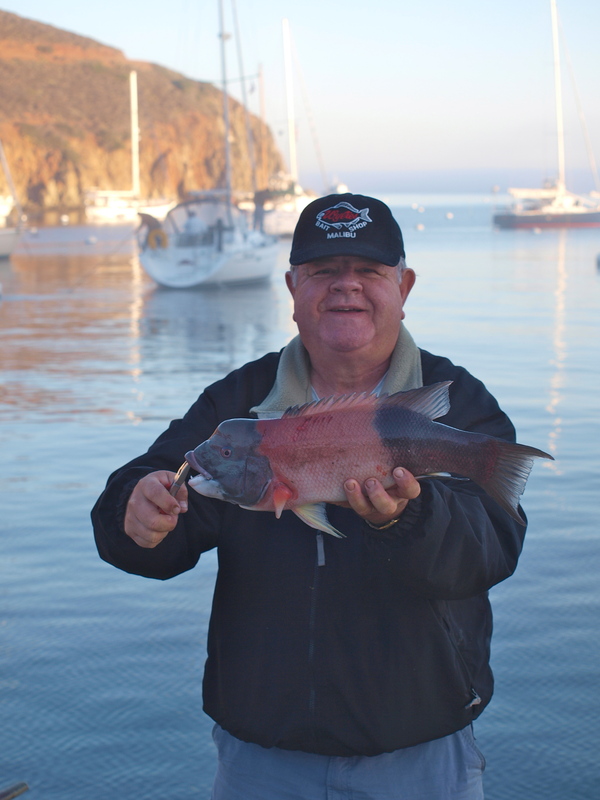 Sometimes your bait will last until the larger opaleye, halfmoon or sheephead decide to give it a try, sometimes not. The key is to check your line constantly, if you are not getting nibbles there is something wrong and it probably means you have no bait. A secondary problem is that bait on the island is limited to frozen bait, generally frozen anchovies or squid. Do bring some live ghost shrimp (great for sheephead and opaleye) and some worms (if you want to simply sample the variety of smaller fry). Two main areas can be fished. The first area is the water that sits between the pier and the float. 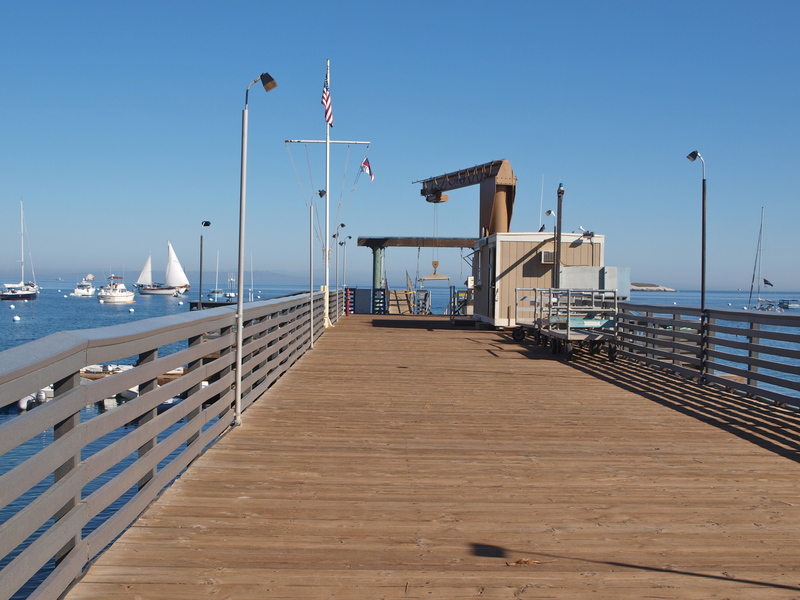 It’s a limited area accessible from the front corners of the pier or from the float itself. Unfortunately you have to be very careful to avoid the various ropes hanging from the pier (so there isn’t much room to actually cast) and the ropes and cables in the water (so watch your line and bait at all times). Expect to lose some sinkers and hooks; it’s almost inevitable. The smaller fish can be from the top to the bottom as can the opaleye although the opaleye (button perch) are usually mid-depth and that’s the place to put your bait. The sheephead are usually on the bottom and quite often you can see big sheephead roamin’ the bottom. Getting them to bite is something else. Fish will also hang under the float and come out to attack bait that is placed straight down from the float. Be ready to strike when you have a hit or larger fish may wrap your line of a cable. Because you want to feel the bottom and feel what is happening, I only recommend a high/low or a single hook tied to the line in this area. I do not recommend a Carolina-type rigging. There are only a few pilings but I have found that both kelp bass and giant kelpfish like to hang right by the pilings. The second main area to fish is out away from the float and I primarily recommend that area in the early morning before the boat traffic gets heavy or in the evening. A long cast out from the end can result in some of the larger fish—sheephead, ocean whitefish, and bigger sharks or rays. Again I recommend a high/low rigging so that you can feel what is taking place. You do not need a fish finder-type rigging (Carolina rig) in this area. As far as bait: if you use pile worms, bloodworms, or lugworms and a size 6 or 4 hook you will catch a lot of fish but many will be small. The worms are ideally suited for the fish that have small mouths like senorita and rock wrasse. 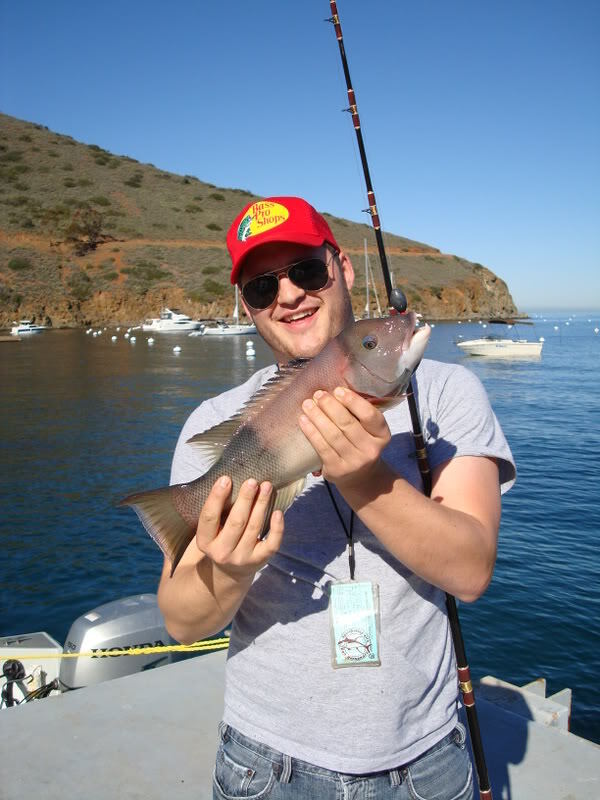 If you use live ghost shrimp you have a chance at the larger opaleye, sheephead and ocean whitefish but the shrimp can also be torn to pieces in a relatively short period of time by the ravenous senorita. To me it’s worth the risk and cost. Triangular or narrow strips of squid are tough and can produce halfmoon, senorita or small kelp bass while large strips may attract a larger bass, an ocean whitefish, or a sheephead. A whole squid during the day may yield a nice sheephead while at night you might hook a bat ray or an angel shark. Market shrimp cut into small pieces can yield almost any of these fish but simply do not yield as many fish. Cut anchovies, sardines, or mackerel generally yield bass during the day and not much else; at night the fish may attract kelp bass, Pacific mackerel and jack mackerel (Spanish Jacks). Of course the problem with cut fish, especially anchovies and sardines, is that the hoards of small fish will often tear the bait to shreds about as fast as you can put it in the water. Frozen peas will catch a surprising number of fish but are primarily used to target the opaleye and generally one or two peas on a small (size 10-6) hook is all you need. Fish the peas mid-depth and always hold your rod and reel when fishing for the opaleye. The pier has since been closed for fishing. There are “no fishing” signs posted on the pier, and they have been screwed in pretty securely, so its probably permanent. Thanks for the information although it’s bad news. I imagine anglers may have interfered too much with the boating (which rules Two Harbors). I guess I will not be spending a couple of days at Two Harbors this winter as I had hoped to do. Thanks for the update although it’s bad news. Guess I will need to revise the article and forget about revisiting Two Harbors as I had planned. You should have tried to beach that ocean whitefish. They are excellent eating fish. Well yes, I’ve caught hundreds of whitefish and they are good eating. As for the fish lost it’s simply one of those things that happen, I thought I could get it up and couldn’t. Given where I was at on the float and the pilings and structures between my spot and the shoreline the option of beaching it didn’t seem good.